You can also perform a more selective search for churches in the Ashby de la Launde area or see them printed on a map. The Anglican parish church is dedicated to Saint Hibald (Hybald or Hibbald). Many parts of the church have been dated to the 13th and 14th centuries. Edward KINGE restored the church here in 1605. The church was rebuilt in 1854. The church only seats about 100 people. The area of this parish once belonged to the Knights Templer at Temple Bruer. A photograph of Saint Hibald's church is at the Wendy PARKINSON English Church Photographs site. Fiona has a black and white photograph of St. Hibald's Church on Flickr, taken in October, 2012. Richard CROFT has a photograph of St. Hibald's Church on Geo-graph, taken in March, 2006. The parish register dates from 1695. The Lincolnshire FHS has a Loan Library service which has the parish registers on microfiche for Baptisms from 1695 to 1812 and Marriages from 1695 to 1809. 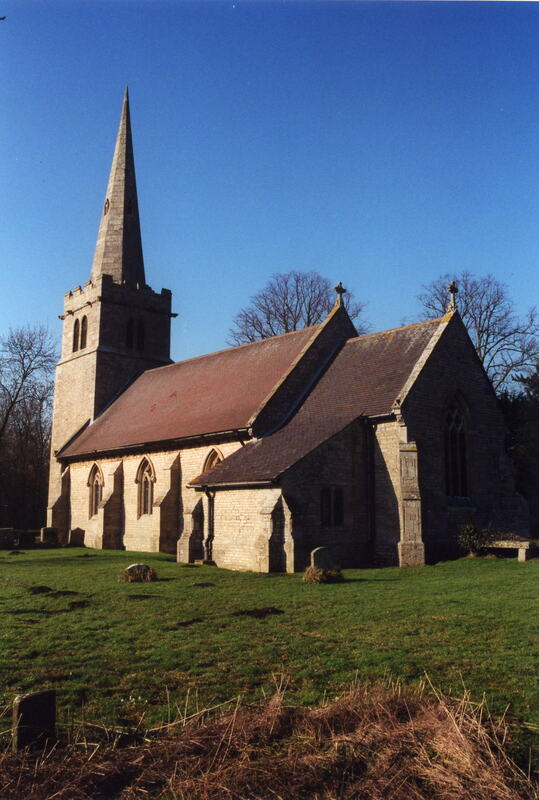 This village and parish is about six miles north of Sleaford. The parish is large, but the village is limited to the two sides of the road. The parish of Scopwick lies to the northeast and Temple Bruer to the northwest, with Ruskington parish to the south. The A15 arterial road passes to the west of the village, but the B1191 trunk road will take you to the west end of the village. Mike PENNINGTON has a photograph of the Village Hall in Church Avenue on Geo-graph, taken in March, 2013. Stop in and ask for a schedule of forth-coming events. This building was part of RAF Digby station until moved here, presumably shortly after World War II. Ask for a calculation of the distance from Ashby de la Launde to another place. You can see the administrative areas in which Ashby de la Launde has been placed at times in the past. Select one to see a link to a map of that particular area. The DE LE LAUNDE family acquired this parish in the 14th century, by marriage with the ASHBYs. They were later succeeded by the KINGE (or KING) family, who became the new Lords of the Manor. The gabled Hall was built in 1595 by Edward KINGE and has a lake near it. In 1871 Ashby-Laund House was the seat of J. W. KING, Esq. After the RAF left the Hall in 1946, it fell into disrepair and was derelict until 1961. In the churchyard is a stone cross with a canopy erected after World War I in memory of the 13 men of the parish who died during that war. Their names are carved on the base of the cross. During World War II Ashby Hall was used by RAF Digby. Originally taken in 1940 by the Accounts Section. In 1942 609 squadron pilots took up residence. They were shortly replaced by Canadian RAF squadron 411. The manor took its name from the "Essheby" family. The parish was in the ancient Flaxwell Wapentake in the North Kesteven division of the county, parts of Kesteven. In April, 1931, this parish was abolished and merged with Bloxholm Civil Parish. Bastardy cases would be heard in the Sleaford petty session hearings. After the Poor Law Amendment Act reforms of 1834, the parish became part of the Sleaford Poor Law Union. There was a school here by 1900.